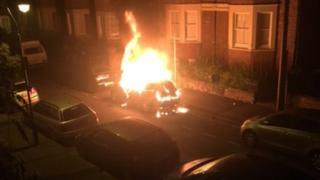 A man accused of a string of arson attacks on parked cars in Oxford has had the charges against him dropped. The vehicles were destroyed on six roads in the Summertown area of the city in August. Nathaniel Padar, 26, of Churchill Place, had been charged with 10 counts of arson with intent to endanger life. But during a hearing at Oxford Crown Court the Crown Prosecution Service announced it was discontinuing the case.